York Lo: For decades after the War, the plastic industry and two closely related industries – toy and artificial flower manufacturing had played an important role in the industrial growth of Hong Kong and thanks to the efforts of pioneering entrepreneurs and the hard work of an industrious labor force, Hong Kong had emerged from nothing to become a top player in all 3 industries in the post war period. While other plastic industry pioneers such as Li Ka-shing, the Ting family of Kader Industrial or the Leung family of Star Industrial (maker of the famous Red A brand) might be better known, a Shanghainese industrialist by the name of Chieng Han-chow (錢涵洲, H.C. Chieng) had earned the title of “Father of the Hong Kong Plastic Industry” as he founded the very first plastic factory in Hong Kong – China Plastics Company (中元塑膠廠) in 1947 and his Wah Sun Hong (華新行) also contributed significantly to the growth of the industry as a leading distributor of plastic raw materials for over half a century. According to an article in Trade Bulletin published in 1958 , Chieng hails from Chekiang, was raised in Hankow, and based on other articles, was born in 1914. After high school he started working in manufacturing and first became involved with plastics in around 1942. He founded the original China Plastics factory in Shanghai – little information is available about the Shanghai factory but it was still in operation in the 1950s under Communist rule as a worker pin with the factory name and a red star from the era is available for sale online. Man-made plastic was invented in 1856 in the UK and plastic innovations such as bakelite and polyethylene after World War I had led to the development of a number of plastic products. In Shanghai, plastic manufacturing existed before World War II with a number of firms making celluloid, bakelite powder and plastic goods such as toothbrushes. However, there was no plastic manufacturing in Hong Kong before the War. In 1947, Civil War had erupted in the mainland and like many other Shanghainese industrialists, Chieng had difficulties importing raw materials or machinery into the mainland. So in May 1947, he opened the first plastic factory in Hong Kong at 2-10 Tam Kung Road in To Kwa Wan. On July 7th of the same year, he married Lucy Liang (梁秀容) in Shanghai but he and his new family soon relocated to Hong Kong as the new factory in the colony commenced operations and the situation deteriorated in the mainland. In 1948, he invited reporters to his factory in Kowloon – and as plastic was a relatively novel item at the time in Hong Kong he started the presentation with a film explaining what it is and its origin. The factory had a 16 ounce injection molding machine (the largest in HK at the time) imported from the United States which was capable of churning out 40 dozens of plastic plates per hour. The first products were plastic plates which came in 4 colors – red, green, blue and pink and its initial markets were Siam (now Thailand) and Malaya (now Malaysia). The same year his products made its debut at the 6th Chinese Manufacturers Association fair (Chieng soon started the Plastics Sub-committee for CMA and served as its head). According to an oral history interview conducted with long time plastic/toy industry veteran Lam Leung, there was another shareholder in China Plastics in the early years by the name of Haming Wong (spelling?) but Wong later immigrated to the United States and hence Chieng became the sole shareholder of the enterprise . China Plastics prospered in Hong Kong and by 1955, monthly production was up to 30,000-50,000 pounds and product types had expanded from plates to 80-90 different types of plastic goods (such as water bottles which retailed for 2 HK dollars each) and export markets had expanded beyond Southeast Asia to Australia and New Zealand. In 1956, the government auctioned off three parcels of land in Kwun Tong for industrial use and Chieng won the bid for one of the parcels (the other two parcels went to Leung So Kee, the umbrella maker, and China Paint the maker of Flower brand paint) for HK$200,000, which was four times the starting bid amount. This was likely developed into 117 How Ming Street which was home to China Plastics and Wah Sun Hong for the next decades, and has since been re-developed into the Entrepot Centre. By the late 1950s, plastic had emerged as the third largest industry in Hong Kong behind textiles and tourism, and in 1957, Chieng co-founded the Hong Kong Plastic Manufacturers Association (HKPMA) which he served as Vice Chairman and with which he remained involved in for the decades to follow. The strong demand for plastic goods including toys and artificial flowers and the low capital requirement to get into the plastic business had led to many new entrants to the Hong Kong plastic industry in the 1950s and 60s, with many Chiuchow and Shanghainese immigrants buying low cost hand operated three quarter ounce injection molding machines (referred to as “75 machines” according to Lam Leung) and setting up cottage factories all over Hong Kong. Initially the supply of plastic raw materials in Hong Kong was dominated by the British and American chemical giants such as ICI and Dow but distributors such as Chieng started sourcing from Japanese, Taiwanese and Southeast Asian suppliers to meet the rising demand, which soared to new heights with the artificial flower boom in the 1960s and the emergence of Hong Kong as the largest toy exporter in the world by 1972. 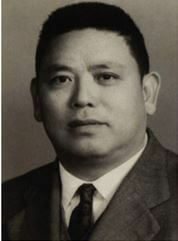 To strengthen ties with his client base, Chieng started signing up plastic manufacturers (which include Shanghainese, Chiuchow and Cantonese, a testament to Chieng’s ability to work with all groups) to become shareholders of WSH in 1971 and by 1974, the firm’s paid up capital had increased to HK$10 million thanks to strong profits and shareholder contributions. According to the proceedings of the 1974 shareholder meeting which was open to the press, shareholders were entitled to buy raw materials at a 10% markup from cost and a starting quota of 40 bags each, existing clients who were not shareholders at slightly below market price while new clients had to negotiate in a case by case basis. Profits were at all time high as material prices skyrocketed thanks to the energy crisis and shortage of supply due to accidents at leading Japanese supplier Idemitsu (#2 oil refiner in Japan after Nippon Oil and part of the Mitsubishi keiretsu) and in an effort to help smaller and medium size manufacturers, 25 shareholders who were the largest manufacturers including Li Ka-shing, the Tings, the Leungs and Lam Leung offered up their quotas. Thanks to Chieng’s business acumen, by 1977 Wah Sun Hong had become the largest distributor in the industry and over time, he completely phased out of manufacturing to focus solely on distribution. In 1974, Chieng and his plastic industry peers established a charity called “Lok Kwan Society” (樂群社) to provide scholarships to the children of plastic industry workers, including a scholarship at Cornell University. As executive director and treasurer of the group, Chieng raised over HK$1 million for scholarships. At the 25th anniversary of Wah Sun Hong in 1984, the 70 year old Chieng (who often worked on Sundays) decided to retire and devote his full attention to philanthropy and donated $220,000 from his pension to various charities. He established many university scholarships under the “Wah Sun” name in various provinces in mainland China such as Nanjing, Yunnan and Szechuan and many Wah Sun scholars have went on to become engineers, academics and other professionals. The family also sponsored the Haven of Hope H.C. Chieng Home Care & Support Centre in Cheung Kwan O. 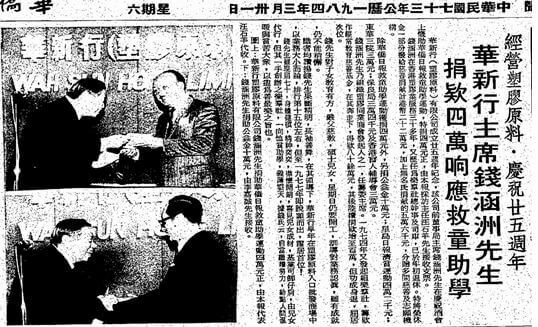 1984 Wah Kiu Yat Po article about H.C. Chieng donating $220,000 to various charities to celebrate the 25th anniversary of Wah Sung Hong. The bottom picture is him presenting a $100,000 check to fellow plastic merchant, Li Ka-shing (by then already acquired Hutchison Whampoa) who was representing the Community Chest. Today, Chieng Han-chow’s business and philanthropic interests are continued by his son Wilson Sai-yung Chieng (錢世庸), who received his B.A. in economics and MBA from California State University, Northridge. Wilson serves on the board of HKPMA and WSH remains a major distributor of plastic raw materials in Hong Kong and China representing 12 major suppliers from across the globe and the firm has paid up capital of HK$100m and a branch office in Guangzhou. In 2014, Wah Sun Hong published a book in Chinese to celebrate its 55th anniversary entitled “HK Plastic Industry – Looking Back at Half a Century of Glory and Looking Forward“ (香港塑膠業逾半世紀輝煌回顧與前瞻). A former director of Po Leung Kuk (1985), Wilson donated a building in Hurtsville, New South Wales to the Australian Nursing Home Foundation which was renamed Lucy Chieng Aged Care Centre in memory of his mother. A member of the Pui Ching Middle School Class of 1966, he donated HK$12m to his alma mater and in 2014, the Chien Han-chow Memorial Building was opened at Pui Ching Primary School in Kowloon by Legco chairman Jasper Tsang, a monument to the visionary industrialist who help started the plastic industry in Hong Kong. This article was first posted on 16th July 2016. I am the daughter of Norman YOUNG Sze Kuen, Cecilia YOUNG Dongling. The article above, on Mr Chieng Han-Chow, (a good friend of my late father and mother’s ) reflects a good and fair record of multiple voices on the early history of the HK Plastic Industry, and to be congratulated. Lately, articles on Mr LAM Leung Tim’s ( employee of Yuen Hing Hong & Co Ltd and its associated industries up to 1960 ) oral history of his role, his sole ownership of ideas in the development of projects in Yuen Hing Hong & Co. Ltd, Winsome Plastics, Factories in Guangzhou etc, printed in SCMP and elsewhere ,are questionable. Because most of the leaders of Industries and its team of workers ( ex engineers from the Mainland in the 1940s) are now deceased, and not much oral history had been recorded ; reliance on ambitious men ,who has longevity as their asset, can be misleading when penning the official Hong Kong Plastic Industry history , I urge researchers to dig into documents of the Hong Kong Plastic Manufacturers Association (mentioned in the article above) formed by the earliest group of recognized effort by their contemporaries of leading figures of the Hong Kong Plastic Industry, the Chinese Manufacturers’ Association and to authenticate evidence by searching Company records of ownership. That much we can do at least to the history of contributions to Hong Kong by our pioneers.